Supplying our local commuters, athletes, and recreational riders with all their cycling needs. 24 hour repair turn around. Excellent Kids Buy up Program. 2018 Dirt Camp Registration Opens Monday, January 15! (Copied from their email): Registration for Evergreen’s 2018 Dirt Camps opens Monday, 1/15—and we couldn’t be more excited to get your rider’s wheels on the dirt! 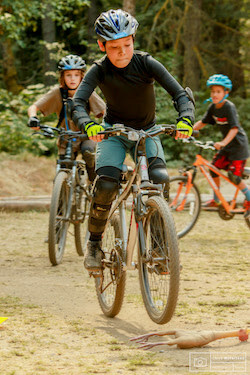 Our wildly popular weeklong MTB camps gather 8-13-year-old riders from across the Greater Puget Sound area for days packed with adventure and fun. Join Evergreen staff, instructors, and coaches at any of our three locations: Duthie Hill, Black Diamond Open Space, or Swan Creek. If your rider is more experienced, we’re offering an Advanced Dirt Camp in August—sign up today to reserve your spot. Whatever your location, age, or level, we’re ready to show our camp participants an epic time—and build some solid skills. 8/6 - 8/10 – Advanced Dirt Camp! Registration opens on Monday (Martin Luther King Day) 1/15 at 9:00AM. We’ll see you this summer for another great year of camp! Lot's of exciting events Peninsula Trails Coalition in 2018! January 12th- “Before Drones I was Tied to the Earth” By John Gussman Techniques and etiquette for using drones to enhance the art form of photographic travel documentary by the photo documentarian of "Return of the River" and recent North Olympic Land Trust productions. January 19th - “ Crop Circles: The Ongoing Enigma” by Mark Schrader Mark will give an overview of the many facets of interest found in these wonderful unsolved puzzles. His 6 visits to Southwest England over the last 10 years will provide a photographic record to accompany his learning from on site workshops, lecture series and over flights. January 26th – “Yellowstone, the Grand Tetons, and Alberta” Elston & Jackie Hill Minus 53 degrees. Icicle clad bison, wolves, few tourists, cheaper lodging. Join long time presenters for tips on gear, planning and their signature awesome photos. February 1st - "Traveling in North Korea as a Party of Two" by Elston Hill. He will share his travels to a country not travelled by many Americans, North Korea. Get an inside look of a country that has been closed off from the rest of the world for many years. Probably your only chance to hear about places and people they encountered on this trip. February 8th - “Arctic, to the Antarctic” By Mark Roye & Nancy Krill. They sailed in the wake of the Pacific Northwest Maritime Fur Trade. Sailing their ketch Tamara from Hudson Strait to Alaska. The couple was awarded the Cruising Club of America's Charles H. Vilas Prize for 2011 and the Royal Cruising Club Trophy for 2012. February 15th - “Klee Wyck Journal: The Making of a Wilderness Retreat” By Lou McKee, adventurer artist, author and dreamer. Tells her story of paddling the waterways of the Pacific Northwest and by chance discovering an enchanting beach. Where the Klee Wyck Cabin was borne. February 22nd - “On Safari in Botswana and Tanzania” By Burt Jones & Maurine Shimlock, award-winning photojournalists. Who usually document tropical marine life and remote dive sites. Will share a different kind of adventure, with their love of adventure and photography we will take a trip to Botswana and Tanzania. March 1st - “Border to Border 3 Friends: A Cycling Adventure” By Leilani Sundt, flight attendant and active cyclist tells of completing the journey from Canada to Mexico by way of bike. The trip was postponed for 2 years while Lelani recovered from injuries suffered by being hit by a truck after only 10 days into the trip in 2015. March 8th - “Kayaking: Exploring Taiwan” By Nigel Foster, one of the best known kayakers in the world, will tell us of his kayaking adventures in Taiwan's beautiful and timeless islands. Nigel keeps busy as an author, designers of kayaks, paddles and accessories while he is not kayaking somewhere around the world. March 15th - “Scotland, North Coast 500” By Tim & Mardi Guthrie. Tim's 20 years of military service allowed them many travels throughout Europe. Joining kids and church mission allowed them to travel to many other parts of the world. This trip brings Tim home to his Scottish roots and the North Coast 500, a little known part of Scotland not to be missed. March 22nd - “Iceland: Land of Extremes” By Arvo & Christiane Johnson. This adventure takes them to the incredible Island of Iceland. A land of many sights and few crowds. This journey will be new one for them in more ways then one, having 2 young kids along their side. New Oregon bicycle tax is in effect. Here is an article from Bicycle Retailer for a few more details. We wish you many the best!